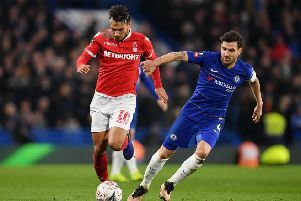 Lewis Baker believes Sheffield Wednesday are capable of forcing their way into play-off contention if they pick up a healthy points haul this month. Stuart Gray’s charges take on Nottingham Forest today for the first of four Championship fixtures which midfielder Baker feels can define their season. After locking horns with Forest, Owls entertain Bolton Wanderers and Birmingham City at Hillsborough before rounding off the January period with a trip to Reading. Baker, aiming to make his Wednesday debut at the City Ground, having arrived from Chelsea on a youth loan deal earlier this week, said: “The team are doing well and are only six points off the play-offs so why can’t we get into them? “If we have a big month, then it’s all to play for. There were a couple of familiar faces who greeted Baker when he trained with the Owls for the first time on Thursday. He knows goalkeeper Cameron Dawson, an unused substitute at Manchester City last weekend, from their days together at England youth level and Sam Hutchinson. Following a lengthy spell on the sidelines due to a knee injury, Hutchinson is in line to be included on Wednesday’s substitutes bench versus his old club Forest. Forest have signed Aston Villa midfielder Gary Gardner on loan from Aston Villa until the end of the season and the 22-year-old is expected to face The Owls today. Gardner has also been at Brighton and Hove Albion on loan.